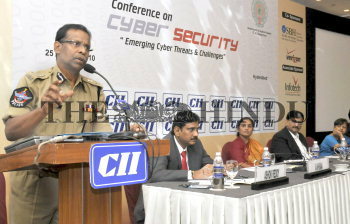 Caption : HYDERABAD (AP) -25-08-2010 -- ( WITH REPORT BY K.V.KURMANATH ) - EXPRESSING CONCERN : Mr. A. K. Khan , Commissioner of Police , Hyderabad Police addressing the CII conference on Cyber Security in Hyderabad on Wednesday . At right are Ms. Renu Challu , Managing Director , of State Bank of Hyderabad , Mr. Shakti Sagar , president , CII , AP Chapter , Ms. K. Ratnaprabha , Principal Secretary , IT&C and Mr Ashok Kumar. PHOTO: P_V_SIVAKUMAR.